One of the unique aspects of our Baton Rouge Family Dental Practice is that we have two Prosthodontists, and a Family Dentist. This allows for a greater spectrum of dental knowledge and more comprehensive care for those in need of a Baton Rouge Family Dental Practice. 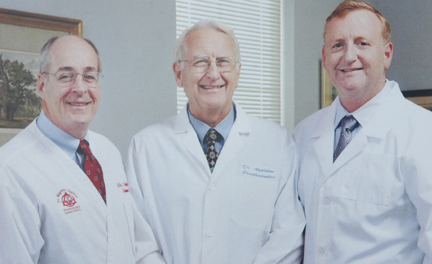 Dr. Michael Maginnis established the first Prosthodontic practice in Baton Rouge in 1973. He was joined in 1982 by Dr. Isaac (Gene) Appleton, a retired colonel in the Army Dental Corps. Both doctors have earned Master's Degrees and National Board Certification in Prosthodontics. Their post-graduate studies, coupled with years of experience in clinical and teaching situations, provide expertise in a full range of services, including crowns, fixed bridges, partial and complete dentures and implant restorations. Dr. Glenn Appleton, Gene's son, is a family dentist with extensive post-graduate training in a three-year residency at the Naval Medical Center in Bethesda, Maryland. He manages the hygiene practice and provides general dental, family dentistry, root canal and surgical services. These multiple specialties, advanced degrees, in-house laboratories and CAD/CAM technology allow the practice to manage both simple and complex treatment plans quickly and efficiently. Many treatments are completed in one day. All three doctors have taught as assistant clinical professors at the LSU School of Dentistry and provide continuing dental education to other practicing dentists.